This is an small, annual species of grass that is found in North America only in British Columbia, Washington and Oregon (USDA 2011). It is rare in southwestern and south central BC, where it is found in damp, muddy lake margins in the lowland and lower montane zones. It is a late-flowering species (October). In his rare plants of the Fraser Valley, Lomer (2011) says: "Coleanthus subtilis has a very fragmented area of distribution. It is rare in central Europe, with historical records in Russia and Austria (Hejny 1969, Woike 1999). It was recently discovered in southern Poland (Fabiszewski & Cebrat 2003). In Asia, it has been recorded in the Ob River watershed (Taran 1994) and in the Amur River floodplain (Nechajev & Nechajev 1972, 1973). In North America, this species was first collected by T.J. Howell on Sauvie Island near Portland, OR in 1880 and later along the Columbia River from Bingen, WA to Portland, OR by W. Suksdorf and others from 1883 to 1927. In British Columbia, it was first spotted by O. & A. Ceska at Shuswap Lake in September 1989 and a few days later collected by M.E. Martin on Sept. 18, 1989 (V: Martin, s.n.). The same year, A. & O. Ceska collected it again on Sauvie Island, OR (V: A. & O. Ceska 26885) and on Hatzic Lake in the Lower Fraser Valley (V: A. & O. Ceska 26868) - see also Ceska (1995). At the BOTANY BC 2002 in Castlegar, O. Ceska spotted two plants of Coleanthus subtilis on the exposed bottom of Lower Arrow Lake near Syringa Creek Provincial Park (A. Ceska, personal communication). North American botanists were puzzled by the occurrence of this species in North America and either considered it introduced (Hitchcock et al. 1969: 539) or were confused about its native status there (Flora of North America vol. 24: 618). Recently, Catling (2009) reported Coleanthus subtilis from the Northwest Territories and concluded that it should be considered "native at all of its North American sites" and gave several valid arguments for this thesis: 1) its restricted and unusual habitat; 2) global rarity; 3) suffusive rarity, which has sometimes been mistaken for introduction; 4) occurrence in botanically rich regions and close association with rare native species; 5) relatively early [or late] year of collection; 6) distribution corresponding to well recognized native pattern; 7) lack of evidence of spread to anthropogenic habitats; and 8) the fact that it is easily overlooked by early collectors because it appears at intervals of several years only when water levels have dropped sufficiently. (Prepared with contributions by Adolf Ceska)." Extracted from Botanical Electronic News #432, January 2011, with permission. Annual, spreading, more or less matted grass from fibrous roots; stems hollow, 2-8 (10) cm tall. Sheaths closed, inflated; blades 0.5-1.5 mm wide, about 1 (to 2) cm long; ligules 1-1.5 mm long, membranous. Inflorescence a panicle 1-5 cm long with 3 to 6, distant whorls of branches in umbel-like clusters, the branches spreading to drooping; spikelets 1-flowered, flattened, articulating below the glumes; florets long-stalked; glumes absent; lemmas about 1 mm long, awnlike tips about equal to the egg-shaped basal portions; paleas about 0.5 mm long, about 1/2 as long as the lemmas, the 2 keels slightly prolonged; rachilla absent; lodicules absent; ovaries smooth, the fruits slender, brownish, spindle-shaped, surpassing the lemmas and paleas; stigmas about equalling the lemmas; stamens 2, exserted; anthers about 0.3 mm long. 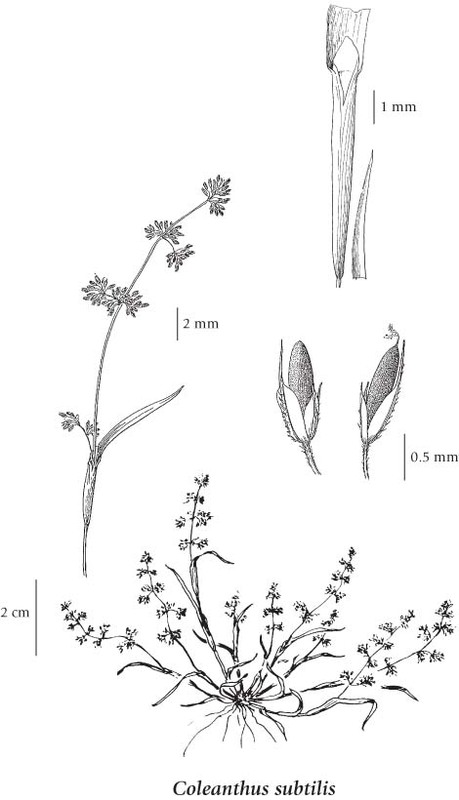 There is a good possibility that this species is a circumpolar disjunct and not merely an introduction since many companion plants occurring at both Shuswap and Hatzic Lakes are the same as those found in Europe (A. Ceska, pers. comm.). The small stature (2-8 cm) of the plant and its late flowering date (October) may be the reason it is known only from the above locations and the lower Columbia River, OR/WA. Damp, muddy lake margins in the lowland and lower montane zones; rare in SW and SC BC, known only from Shuswap and Hatzic Lakes; native to N and C Europe.